Tuberous begonias (Begonia x tuberhybrida) flaunt opulently large single or double blooms up to 8 inches across in almost every shade except blue. They include the Camellia-flowered, Rose-flowered, Picotee, Multiflora and Pendula groups, all of which can be hardy in U.S. Department of Agriculture plant hardiness zones 9 through 11. Elsewhere, after the plants die down in autumn, their tubers must be stored indoors over winter. For the longest bloom season, start your begonias indoors in late winter or early spring three to four months before you wish the plants to flower outdoors. 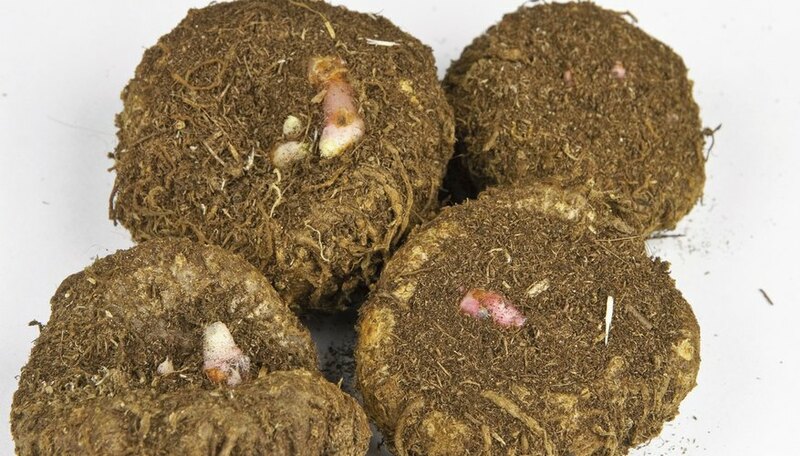 Because begonia tubers are prone to rot just after being planted, start them in a shallow container -- such as a flat with drainage holes -- which has been filled with 2 1/2 to 3 inches of damp peat moss, vermiculite or light potting soil. Press the tubers into that medium with their rounded bottoms down and concave tops up, spacing them at least 3/4 inch apart and covering them with about 1/4 inch of the medium. When you water that container, be careful not to get any water in the tubers' concave cups. Place the flat in a warm area, with bright, indirect light and temperatures between 68 and 72 degrees Fahrenheit, and continue to keep the medium lightly moist as the tubers sprout. When the tubers are well-rooted and have put up shoots 1 to 2 inches tall, transplant them into individual 5- to 6-inch pots filled with an acidic potting soil, preferably with a pH between 5.5 and 6.0. Cover each tuber with 1 to 1 1/2 inches of soil. Position the pots under a grow light or on a windowsill that receives sun during the morning and bright, indirect light the rest of the day. Two weeks before your last frost, begin placing the begonias outdoors for short periods of time, setting them in the shade first and gradually shifting them to a site with morning sun. Bit by bit, extend the time period that they're outside, but never forget to bring them back indoors by evening, because they are very sensitive to frost. Once all danger of frost has passed and your plants have grown to at least 4 or 5 inches, you can move them outdoors. If you prefer to transplant the tubers for hanging-type begonias into larger containers, use only three medium, two large, or one jumbo tuber(s) in an 8- to 10-inch pot. A medium tuber is under 2 inches in diameter, while a large one measures 2 to 2 1/2 inches across, and a jumbo tuber is larger than 2 1/2 inches. Upright begonias need more room and you should plant only one tuber of any size in an 8- to 10-inch pot. Make sure any container you plant in has drainage holes. Before potting the begonias, mix 1 to 2 tablespoons of an organic bulb fertilizer, such as 3-8-8, into the soil for each tuber. Water the plants well afterward, but avoid splashing their foliage; continue to water them frequently enough that their soil remains moderately moist. If you choose to plant your begonias in the ground instead, choose a site with rich, acidic, well-drained soil that receives sun only in the morning or late afternoon. Plant the begonias 8 to 12 inches apart, at the same depth they grew in their pots. Either work 1 to 2 tablespoons of the 3-8-8 bulb fertilizer into the bottom of each hole before you set the plant in it or scratch that amount into the ground around each plant after you fill in the hole. After watering the begonias, mulch them with 2 inches of shredded bark or compost to help keep their soil cool and moderately damp. Water them as necessary to retain that level of moisture. CalBegonias: Planting Begonia Bulbs – How Many Tubers Per Pot?